It all came to a head at a horse show in New York two years ago, when Sylvia Hoyt’s lingering problems with riding were on full display. After over three decades on a saddle, then 40-year-old Hoyt had to ask herself a question: was this the end of her equestrian career? And even more importantly — would she be able to ride anymore? Swallowing her pride and committing to a road to recovery, Hoyt returned to the sport she loved and won two gold medals at the Pinto World Championship Show in Tulsa, OK earlier this month. A choice that all high-level athletes have to make at some point in their career, Hoyt made the decision that it wasn’t her time to give it up — not yet. The Hampton native has been riding horses her entire life. Her father bought her a pony when she was four years old, and it’s been a lifelong bond ever since. About three years ago, Hoyt started noticing some problems. At first, she said she chalked it up to a poor bond with her horse. Her coaches were starting to get irritated, and she said they were giving her tips on things she learned as a kid. At the competition in New York, one of the girls she shows with was watching her ride and said her pant line was crooked. And then when she inspected her off the horse, she said her one shoulder had dropped and she was completely out of alignment. She started seeing Dr. Erik Klein, a chiropractor and CEO of Town Health Solutions, to work on her alignment issues. From his experience working with runners, Klein said he told her to take a video. The results were “very disturbing,” said Hoyt. If she was a car, Klein would say her “struts were shot.” In other words, her hip flexers were so tight that when she was trotting, she couldn’t sit though the motion of the horse. Klein said he had to “reverse engineer” upwards of nine lingering problems. But with progress came motivation, and Klein said he could see Hoyt’s trust in him building. “I never anticipated it would take as long as it did to get my body to hold on to the changes,” said Hoyt. She was working with a personal trainer, going to see Klein, started practicing yoga, and even had to re-take basic riding lessons like those she did at age 12. 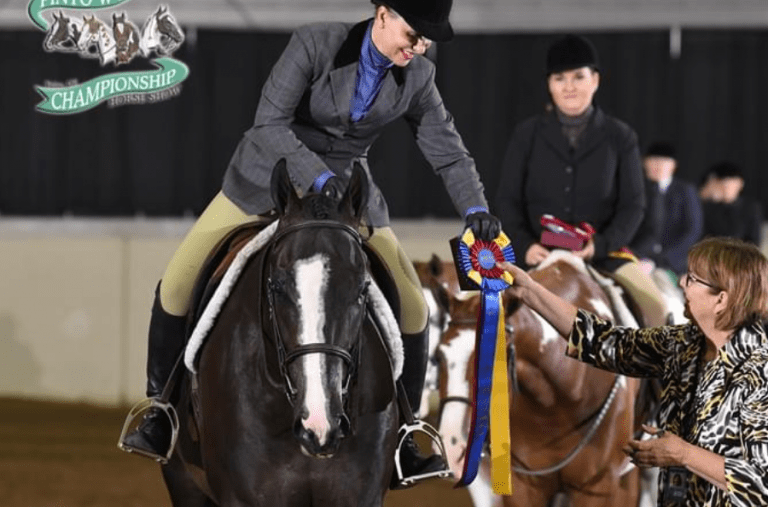 In October, Hoyt competed in the All American Quarter Horse Congress in Ohio, regarded as the largest single breed horse show in the world. Two top 10 places later, and a showing she considers among “the best I’ve ever done,” Hoyt had her confidence back. In June she captured two golds at the world championships in the amateur hunter under saddle and amateur senior English pleasure categories. Hoyt still sees Klein on a monthly basis, and has upped the amount of riding she has done in between competitions. She’s still working out, and is keeping up with her yoga as well. “It makes me thankful that I persevered and I didn’t quit,” she said.